Ester Pavlů interrupted her career just for few months after giving the birth of her baby boy Filip. Four months after this she is ready for her first major performances: it takes place in the Municipal House in Prague on Oct. 19 and 20 2016. She is going to sing the aria of Eboli “O don fatale” from Verdi´s Don Carlos and a duet with José Cura from the opera Il trovatore. She met the famous Argentinian singer in February 2016 as a participant of the master courses, which he led in the role of residential artist Prague Symphony Orchestra. She is going to sing along with other participants of the master courses. The programme is includes the works of Giacomo Puccini, Giuseppe Verdi, Georges Bizet and Ruggero Leoncavallo. “During the courses I promised to José that he will be the first whom I´ll tell about my baby being born, and so I sent him a photo directly the delivery room,” said Ester Pavlů. She appreciated that Cura led participants to the natural singing and warned against pretending the “great art”. “José is of course a really big star with everything that goes with it, but he is a very friendly and nice person. I think we were close. In addition, he also likes different genres of music as me, not only that classical, “said Pavlů. For example, in concerts, he often sings Yesterday by the Beatles just with guitar. Ester Pavlů listens and often even sings other generes as well due to the fact that her parents, Eva and Ivo Pavlů are members of the popular rock band Krásné nové stroje. Moreover, this year she performed as a guest on the stadium in front of twenty thousand people during the celebrations of the existence of the rock band “Keks”. The young singer has no fear that pregnancy affected her voice. “After having a baby your voice matures, it is similar as the pregnancy itself changes the girl body into the woman one,” said Ester. She admitted, however, that due to the break she had to start work carefully. ” The voice is actually the muscle, and when it is not trained you cannot lift heavy weights straight from the beginning, it is the same as in sport ,” she said. Ester Pavlů is now rehearsing for the role of Olga in Pilsen in Eugene Onegin Opera by Pyotr Ilyich Tchaikovsky that premieres on Oct. 22. Later she goes on tour across France with the Christmas performances. 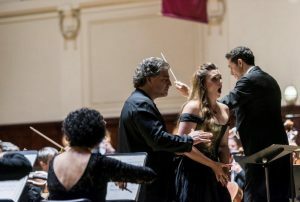 A photo from the concert Oct. 19 2016: José Cura and Ester Pavlů during the duet from Il trovatore.